Hello and Happy 2017 everyone! 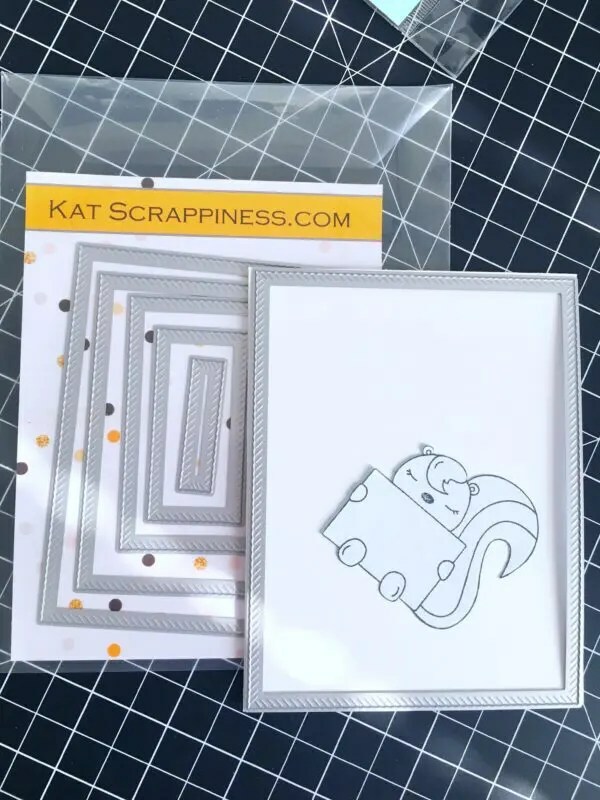 This is my first design team post for the year for Kat Scrappiness and today I am sharing a card, showcasing the Little Stinker stamp set by Neat & Tangled, the Stitched-Rope Nested Rectangle dies and a bunch of other supplies available at the shop. I apologize if I will not have a process video for you today because I still didn’t get my voice back. I have currently have bronchitis, and I am still trying to get rid of this flu. It has been a few weeks now and it is starting to bum me out. Anyway, I have taken some step-by-step photos of my project so I will try and walk you through it. 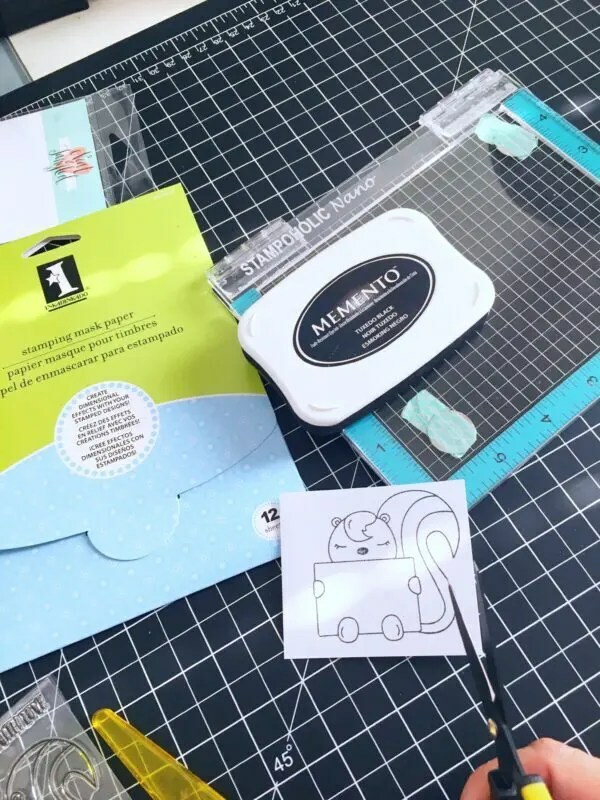 I started out by stamping the image on Inkadinkado Masking Paper, and fuzzy-cut it with my honeybee scissors. Since this is a one-layer card, I will be using my mask to cover the image. I die-cut my card panel using the stitched rope nested die on Neenah solar white card stock. I then used my mask to cover the Little Stinker image so I can distress the background with my distress inks. I also cut a mask for my grass hill with the masking paper. 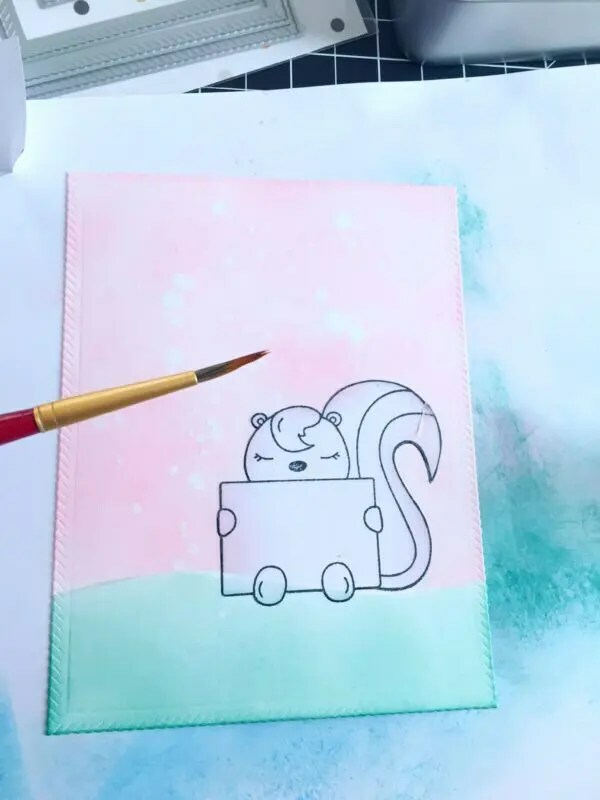 I used Spun Sugar and Evergreen bough to distress my background. Once I was satisfied with the color combination, I used my paintbrush to splatter some water on my card panel. Distress ink reacts on water and it really gives a cool effect. 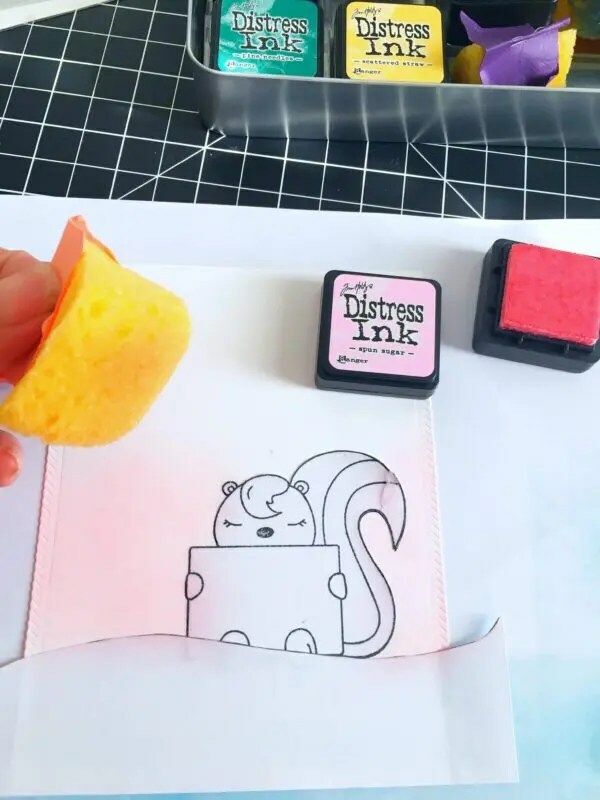 I peeled the mask that was covering the skunk, and started coloring the image with my Copic markers. I used T0, T2 and T4 for my skunk. I also used R00 for the cheeks and the little sign that was being held by the little skunk. I stamped the sentiment on the sign using my Memento Tuxedo black ink. Since this is a Valentine’s Day card, I felt that I needed to add some hearts. I had an older stamp set from my stash with splattered hearts images and I thought this would be perfect for my card. 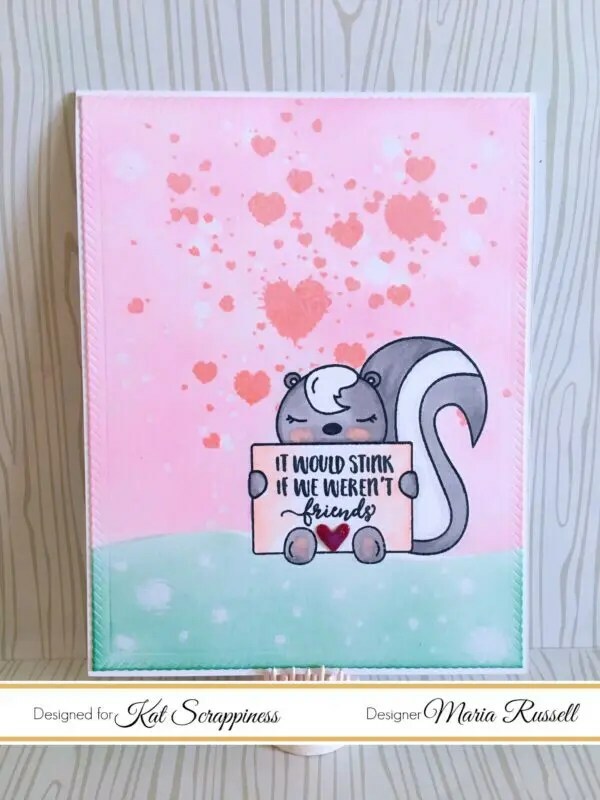 I used the same mask to cover my skunk again, and stamped the front panel of the card with the heart stamp. It turned out really beautiful! 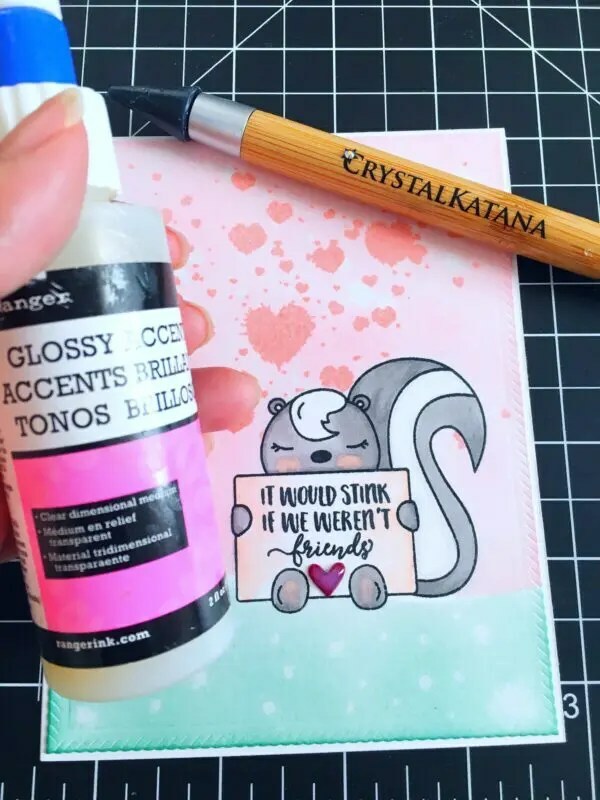 To finish off the design of the card, and with the help of my favorite tool, the Crystal Katana, I adhered a tiny red heart on the sign, and covered the heart with glossy accents. I love how the card turned out! I hope you love it too and got inspired today. The supplies I have used are listed and linked below if you are interested to purchase them. Have a wonderful day! Your card is so stinkin cute Maria! Love the splattered heart background! Hope you feel better soon!